The trade paperback edition of Flight to Opar (Restore Edition) by Philip José Farmer (edited by Christopher Paul Carey) is $20. 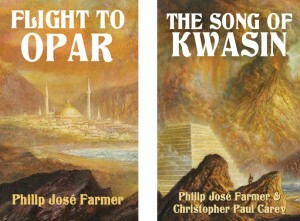 The trade paperback edition of The Song of Kwasin by Philip José Farmer and Christopher Paul Carey is $22. With the package deal you can save $4, getting them both for $38 (+shipping). Purchase the package deal December 29th – 31st and we will refund $5 of the purchase back. Both books are signed by Christopher Paul Carey!